It’s been a couple of months since I’ve blogged. WHOOPS. However, in all honesty I’ve not had that much to say, although I can announce that my Necromunda novella ‘Wanted: Dead’ is going to be released by Black Library this year (I don’t know when yet). I’m hoping I might be able to give some more fun and interesting news soon, but for the moment that’s about all I’ve got. And I just don’t think that’s helpful. Because I keep seeing these things. Things about how “all writers hate what they’ve just written”, or “all writers experience self-doubt”, “all writers experience imposter syndrome”, “everyone struggles on their second book”, all sort of variations on how you have to be depressed to be creative, and so on and so on ad bloody infinitum. 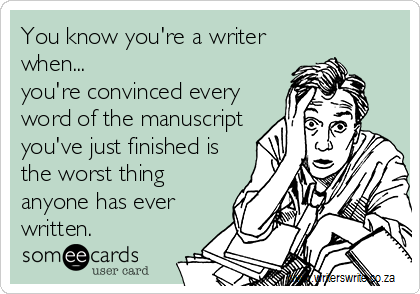 Now, I acknowledge that there are many writers who struggle with these issues. There are many writers who experience poor mental health during their lives. There are many writers who are their own worst critics, sometimes to the point of paralysis and being unable to show anyone else anything they’ve written. 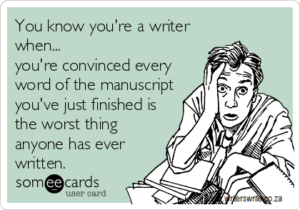 Certainly there are many writers who’ve struggled on their second book! But these things do not define a career. They certainly don’t define writers. I am most definitely a writer, people actually give me money for the things I’ve written (sometimes, anyway), and I’m doing pretty well, thanks very much. I don’t get writer’s block, my mental health appears robust, my second book was actually easier than the first… I don’t say these things to gloat, because I’m well aware how lucky I am, just on a general basis, not even particularly in comparison with other writers. I say these things because a) I get annoyed when people imply that I can’t be a writer, because these things that they say affect all writers don’t affect me, and b) as I said above, I really don’t think it’s helpful. Because there is a difference between “everyone experiences this!” and “it does not make you any less valid as a writer if you are experiencing this”. I worry that by focusing on the pain, discomfort and anxiety that society tells us goes hand-in-hand with “being creative” (tortured artist, gah), we are in some ways conditioning people to expect to experience these things. That it’s necessary. That, in fact, if they aren’t experiencing these things, that that is a bad thing. I don’t want people to think that they’re not going to be any good at creating stuff if they’re having a good day, mentally. I don’t want someone to be so convinced that their second novel is going to be hell that it becomes a self-fulfilling prophecy. And don’t get me wrong, I’m quite sure there are people who genuinely do their best work when in the grip of personal demons – I don’t think Trent Reznor’s written a single memorable song since he got off the drugs, for example – but I don’t believe it’s universal, and overall I’d prefer it if people weren’t struggling so hard in the first place. So that is what I’d like. I want less normalising of personal pain in the context of being a writer. I want the discussion to shift from “Everyone is like this! This is just how it is! Get used to it!” (which, at the end of the day, is what those memes are saying) to “You are not alone in this, this experience does not make you weak or invalid, but nor is it an inescapable consequence of the creative path you are pursuing. If you come out of this, your work will still be just as valid”. End of rant, and back to the writing. Keep well, everyone. Honestly, I really agree with you. I struggled for a long time with the fact that I wasn’t a “tortured artist”. I was convinced that I couldn’t write convincing emotional conflict if I didn’t have more than my fair share of experience with it. Which only encouraged me to court drama and conflict in my own life. Hardly healthy. Thankfully I got over that quickly enough, but it was a hard lesson learned that might have been avoided if we didn’t romanticize the idea quite so much. Yeah, I think we really need to concentrate on promoting healthiness in terms of attitude and mindset, while also not demeaning or belittling people who, for whatever reason, don’t have that at present. If I understood correctly, your ‘other’ job is or was working with homeless people. My own experience (without being a proper, published writer however) is, that having a profession where you ‘go in deep’, meaning you DO have daily contact with people in need and some of them are grateful and give you the simplest of feedback (an honest, unbelieving smile) will make you more grounded, more… I don’t know, it gives you somehow more gravitas. At good days in the evening you feel like being personally treated by life and karma and whatever with special care, with dignity. Yes, that’s it – sometimes one does feel like being hugged by karma. I guess where I´m heading with this is that being a writer on top of that is indeed THE cherry on top. Your own personal aforementioned experience gives you the emotional and intellectual freedom feeling to create something WITHOUT the need to prove your worthiness towards fate (life, karma etc.) by just your writing – as opposed to full-time writers who never had a long conversation with a longtime (or even lifelong) unemployed person, a refugee or a beaten-up woman running from her violent partner. You write hugely entertaining and well-yarned great scifi (trust me, I´m a reader of that stuff for 35 years now) and you probably do it (and do it so well), because you like it. There is no need to feel targeted by those posts and memes. They are not for you. They are for people who have nothing else but their creativity. Nothing wrong with that, of course, pleanty of space under the sun and equally entertaining or touching stuff can come from under their palms too… But it´s simply just a different world. I´d recommend, never loose your grounding (interests, daily job, helping other people etc.) however well you get paid for your writings in future. That way you’ll probably never loose your own fun in the ride. I wish you all the best, mate.